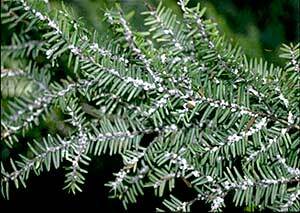 The hemlock woolly adelgid was introduced into Massachusetts in 1988 from an already existing infestation in Connecticut. It attacks both the Carolina and Eastern hemlock and is capable of severely weakening and killing its host plants. Healthier plants, prior to infestation, may endure longer, but previously stressed plants may die in 3-5 years. The key to its management is to recognize it early and implement the proper management strategies. 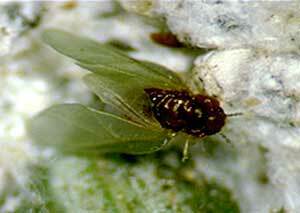 The hemlock woolly adelgid (HWA) is a tiny insect that is closely related to the aphids. Adelgids, in general, are associated with conifers and produce galls and or woolly masses. The HWA only produces woolly masses. This insect is atypical of most insect species in the Northeast in that it is inactive for much of the growing season and very active throughout the winter. From mid-July until mid-October, they are immatures (nymphs) and are flat, black, oval, and ringed with a fringe of white waxy strands. These very tiny nymphs can be found at this time settled on the stems of the host at the base of the needles. They neither feed nor develop during this time period. In mid-October, they resume feeding by using their piercing-sucking mouthparts to remove plant sap from the twigs of the host plant. 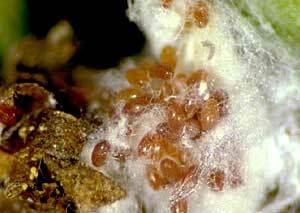 While they feed, they develop into adults with new egg-masses appearing beginning in March. These are the most noticeable stage of the pest and have the appearance of small, white cotton balls lined up at the base of the needles. From then until June there can be many life stages present at one time and much feeding and injury can occur. There are two generations per year. Magnification is required to see all of the individual life stages. Plants growing in stressful sites (compacted soils, ledgy soils, poor drainage, drought prone, etc.) are much more apt to succumb within 3-5 years from this pest's invasion. Hemlocks in more natural (healthier) settings, such as the forest, have been shown to withstand infestations longer. Once found in the landscape or nursery, management is usually necessary. Forest trees may present a management challenge, although options do exist. For more information regarding management of HWA in New England Forests, visit: https://extension.unh.edu/resources/files/Resource005573_Rep7772.pdf. The HWA, in the landscape and nursery, is very manageable if the problem is addressed early and aggressively. One option that poses reduced risk to non-target insects is the use of horticultural oils. These can be applied as either a dormant oil spray and/or as a summer spray. In order for these to be effective, the application must be thorough throughout the entire plant and may need to be reapplied later in the growing season. It is essential to kill virtually all of the HWA on a plant or the population will soon reappear at unacceptable levels. 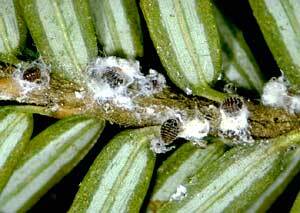 Other active ingredients that have been shown to effectively manage the hemlock woolly adelgid include imidacloprid and dinotefuran. Imidacloprid has been shown to take several months to take effect after application, but research suggests it may protect trees from hemlock woolly adelgid for up to 5 years. Imidacloprid has not been shown to effectively manage the elongate hemlock scale (Fiorinia externa). In cases where a hemlock is infested with both the elongate hemlock scale and hemlock woolly adelgid, dinotefuran is an active ingredient that can manage both insects. Dinotefuran may be effective within weeks of application. Dinotefuran may protect trees from HWA for approximately 2 years, according to research. Products containing dinotefuran are currently listed as state restricted use products in Massachusetts. For more information, visit: https://www.mass.gov/pesticide-product-registration. 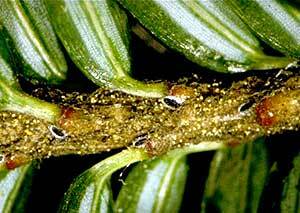 Once this pest is in any given area, it will constantly pose a threat to all hemlock, even those that have been treated. Therefore, all hemlocks in these areas should be monitored carefully several times a year and treatments applied when it is found, as necessary. Wind and birds are the primary means for moving this pest from one area to another but humans can also move this pest on plants if care is not taken. Certain species of Asian hemlocks are resistant to this pest and nurseries are beginning to grow and sell those in the United states. The western hemlock (Tsuga heterophylla) is a native species and is highly resistant to this pest but it does not grow well at all outside of its native range of the northwestern USA.